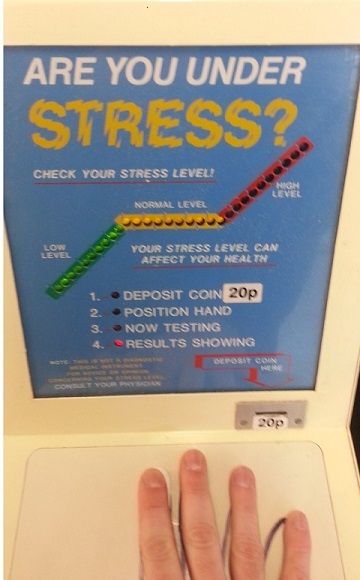 On my way to work this week I spotted an old coin-operated stress tester. I haven’t seen one of these devices in a while. They use to be a common sight at shopping arcades, typically sat next to a weighing scale machine, I suppose offering an impromptu medical check-up while your out and about. Hopefully nobody took this thing seriously as it’s a complete sham! 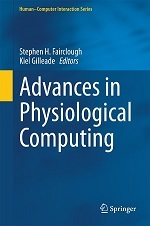 As far as I can tell from playing around with the device, it operates by recording a few seconds of galvanic skin response (GSR) activity across two adjacent finger tips and compares it against representative values of different stress levels in order to determine the user’s level of stress. The problem though is GSR is ill suited for this type of spot-check stress test. GSR is a measure of electrical resistance across the skin and there is no normative baseline for skin resistance. It varies according to a variety of factors (e.g age, temperature, sensor hardware) preventing comparisons between people and comparisons between recordings with the same person. Subsequently to use a spot-check reading as a diagnostic tool doesn’t make any sense as absolute values are meaningless. A better measure in this situation would be heart-rate which does have normative baselines which a reading could be compared against. On the plus side the device is visually informative, green for low stress and red for high stress, but when the measure is meaningless it kind of defeats the purpose. And while the small print on the device does say “This is not a diagnostic medical instrument” it’s somewhat unethical to sell a medical themed diagnostic with is fundamentally flawed. Just for fun I compared the stress tester against a heart-rate based stress tester, Azumio’s StressCheck app. 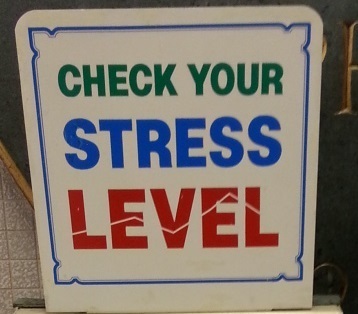 According to the stress tester, my level of stress was normal, StressCheck on the other hand recommended I sit down before I fell down. A tad early in the day to feel that level of stress but I had just walked up several flights of stairs! 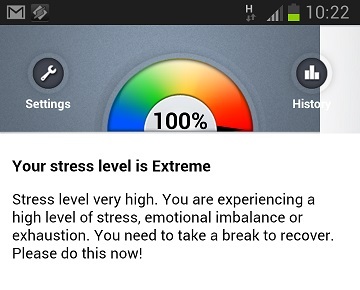 This entry was posted in Musings and tagged azumio, gsr, stress on November 12, 2013 by Kiel Gilleade.